Outline: Because different Muslim sects have different views about the death of Christ, this script uses a question about it as an opener. Quotes Isaiah in answer and then tells why He died - as atonement, and the facts of His death. His resurrection and ascension described. Fulfillment of prophecy. Christ's return will be to judge the world. Urges listener to repent while there is opportunity. Although focused for Muslims, can be used where there is some background knowledge of Christian and Jewish Scripture. Did the Messiah indeed die? Is the story of His death really true? There is no doubt about this, according to what the prophet Isaiah said of Him. It is written, "He has made His grave with the wicked." Yes indeed, the Messiah* died by the hand of man; but God sent Him to the earth to pay with His life, for the sins of the people. Those who repent and receive this payment will not have to pay, themselves. God said there is no salvation unless one without blemish (sin) sheds his blood and dies. In that way the payment could be made for our sins. Christ is the only One who was without sin. He was the only One Who could make this payment. He accepted the debt of our sin, and paid it with His blood. He exchanged His life for our sins. How did it happen that He died? Pilate, the governor, was examining Him. He said, "I find no fault in this man. I will punish Him and let Him go." But the people answered, "Many people are following this man. If you let Him go, you will not be the king's friend." When Pilate heard these words, he said, "Take Him yourselves and judge Him, because I find no fault in Him." Then He washed his hands and said, "I am not to blame for this man's death." 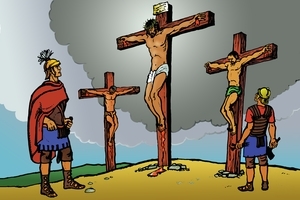 Jesus left the court of judgment and took His cross with Him to the place where He was crucified. All the people followed Him. Was He not able to save Himself from His enemies? Of course He was able, but He knew it was written about Him, "For the sins of my people He was killed." There He hung with nails driven into His hands and feet, and His back bruised with the rod. Hear His words (prayer), "Father, forgive them. They do not know what they are doing." The death of Jesus was known very far, because for three hours the country was in darkness. The earth shook and many of the dead people came to life and went into the city. Many people saw them. Jesus' enemies thought they had conquered Him because He died. They used a cave for a grave for Him, and put a great stone at the door. Then they put soldiers there to guard it. All these things proved that He was the Messiah. He said of Himself, "I have the power to dismiss my spirit (to lay down my life-to die) and I have power to take it again." This was not the end. Death could not hold Him. On the third day the power of God raised Him from the dead. Many people saw Him. At one time 500 men saw Him. He was not a spirit. He said to Thomas, one of His friends, "Put your finger into the holes made in my hands when they nailed me to the cross, and do not doubt, but believe." He was on earth for 40 days, and talked and ate with His friends. Then they saw Him rise from the earth and go back up to be with God. Before He went He said, "Go and tell all people what you have seen." From the beginning God has promised that one day the Messiah would come, and that He would save the people from their sins. Now He has come, but many people did not know Him because He did not come as a great king. Happy is the one who receives Him and follows Him now. He will not refuse those who come to Him. Pray and ask Him to receive you. He will hear you if you talk to Him. **Jesus lives forever. God said in His Book, "He will not rot in the grave." He arose from the place of the dead and later ascended into heaven, and some day He will return from heaven to judge the world. God's Book says God has appointed Jesus to be the Judge at the last Judgment Day. If you have refused Him, He will refuse you then. If you repent and receive Him now, He will take away your sins. When you die He will take you to live forever with Him. Believe on Him now. This is your opportunity. (For non-Muslim groups, "Messiah" can be changed to "Son of Man"). GRN has recorded a version of this script in 185 languages and dialects. See full list.